Last fall, one of my cousins asked if I would make her wonton noodle soup. Sure, I said. Just come over whenever. And whenever she did, dropping in on a random evening, so this soup had to come together fairly quickly. This broth is a bit on the bland side, if you've got time, I'd recommend making a proper Canh (Vietnamese Soup Broth). I set her to work washing the bok choy and soaking and cutting the shiitake mushrooms, while I quickly stuffed the wontons. 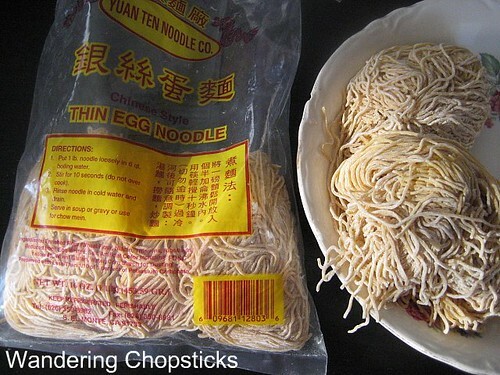 Most chow mein noodles come wrapped in individual bundles. Figure on one bundle per person. Peel and devein the shrimp. Fill a 5-quart stock pot halfway with water and toss in the shrimp shells. Add 2 tblsp fish sauce and 1 tsp salt and let the water come to a boil. Meanwhile, in a food processor mince the shrimp with the chopped scallions and 1/2 tsp salt. 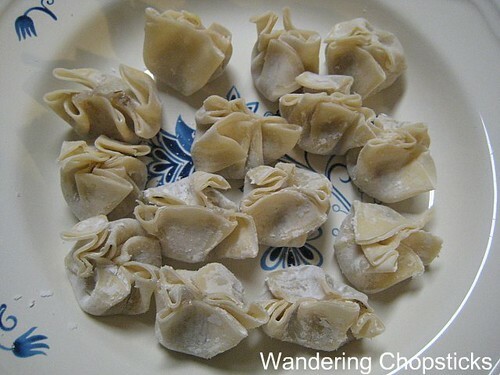 I just quickly wrapped my wontons into irregular bundles because I had hungry cousins waiting, but you can certainly take the time to fold them pretty if you wish. When the water boils, taste, and adjust if necessary. When the broth is to your liking, fish out the shrimp shells and toss in the wontons. Drain the shiitake mushrooms and add them as well, along with the noodles and bok choy. Hey, I did say this came together rather quickly and it all goes into your belly anyway. If you don't plan to finish all the noodles in one sitting, then you'll want to prepare individual bowls or else the noodles will absorb too much water and become mushy. 1 year ago today, Vietnamese-American-owned Cajun crawfish at The Boiling Crab - Alhambra (Valley Blvd.). Hey, I'll take one-pot cooking anytime I can! The finished product is beautiful. Looks much better and fresher than pretty much any soup I've gotten in an Asian restaurant in the US - this one sounds easy enough to give a try! Wonderful recipe! I rarely leave comments but this one got me all happy! Lazy cook. I try and cut corners when I can. Plus, I think from start to finish, this meal was on the table in half an hour. This is a quick and easy recipe to try. Is it the simplicity that did it? Your recipes are way to complicated and gorgeous for me! ooh i like your wontons. make me more! You said you didn't like them. Too bland! 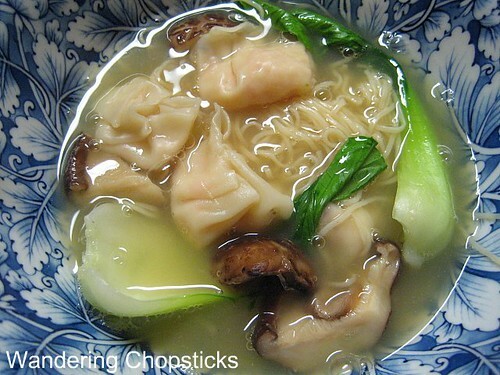 One lazy way to make a broth for wonton soup is Japanese hon-dashi. Not as good as homemade, but surprisingly decent compared to other cheat-y broths (like canned chicken broth or bouillon). My friend gave me several packets and they're wonderful. Definitely not fake-tasting like canned broths or bouillon cubes. Finally made this tonight. Turned out great! I need more practice folding wontons though! Thanks for such perseverance! Did you see my wontons? They were just hastily folded together. Just as long as it tastes good!